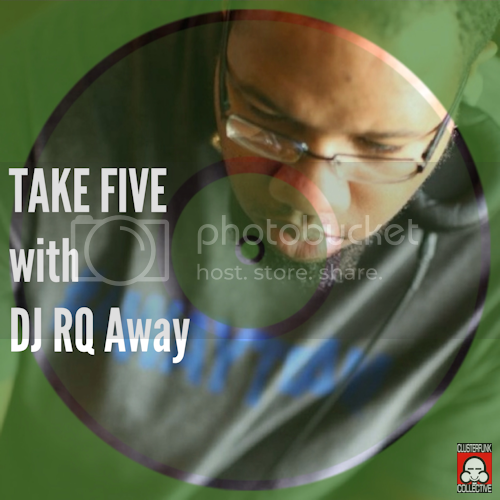 Father, philanthropist and purveyor of potent mixes, DJ RQ Away, sheds some light on the #Awayteam, record selection and his enhanced sense of community. 1) Tell us a little bit about the Away Team. The #Awayteam is an effort to achieve education, unity, and progression via music, charity, and fun. It is a brand modeled after the idea that anyone can be a help to those around them, even when they are having fun. Event-wise The Tipping Point (weekly event) serves as a headquarters for social and charitable events. In the community, I started a discount program to encourage #Awayteamers to support local businesses and try new things. Also #Awayteam organizes bike rides and, more recently, fishing workshops. These are efforts to get people to try things that are good for them, and maybe have been on their list of to do's but they needed the social encouragement. Right now (October) we are celebrating "RQtober", a celebration of the #Awayteam mission and also the 5-year anniversary of The Tipping Point. And we aspire to do so much more in and for the community. 2) What is the most significant change that has resulted from the group's community efforts? The most significant changes are actually small, some people who've spent time around me and #Awayteam have become more informed, and also more willing to inform others of issues, new music, food ingredients etc...lol. 3) How many organizations are partnering with the Away Team at this time, and how can prospective partners start to network with you? Quite a few organizations partner up to aid in spreading the word, and creating social events and opportunities. OnPoint Productions, S.W.M.N. Publishing, T Ray Productions, Diva Dawg Restaurant, 2 Cent, Uniquity Music and others. Also we have over 14 local businesses partnered with us via the #Awayteam Member Discount Card, a program that I started earlier this year. 4) Do you work with all vinyl formats or strictly 12" records? 12" records are my usual preference, but as my 45s collection grows I intend to use them more. 5) How has becoming a father made your mission more important? Yes, quite a bit. My personal mission is to educate and train myself so that I can be a better benefit to my community and family. As a college student, family meant my mother and a few friends that lived in and around the city. Life experiences have since changed that perception; family now means my son who sprouted, a fresh tooth as well as those around me in any capacity. The random man on the bus is family, the woman sitting next to me at the city planning meeting, same thing. Making sure he grows to be a benefit to his community, himself and his family is paramount at all times. While spinning records, driving around the city, even when I sleep, his well being and future are the foremost thoughts on my mind. The only way I can teach him to be great is to be great myself and it takes a lot more than drinking less, using better language and lessening my time outside of the house to be that. It is demonstrating care and respect in every word and action he witnesses, taking better care of my health to be here when he needs a talk after a bad semester in college and so much more. Simply put - his existence has made my mission to help others more important than everything else (except him). LISTEN to his mixes here.